A Spectral Mystery – Solved! We were recently contacted by a university Safety Officer (SO, from now on). A researcher using our Model SFA Stereo Microscope Fluorescence Adapter with Royal Blue excitation thought that the light source might also be emitting hazardous shortwave ultraviolet radiation. Properly concerned for general lab safety he stopped using the system until he could confirm that there was no UV hazard. Our immediate reaction was ‘Of course that’s not possible!’, but we take any safety concerns very seriously and worked with the SO to find a way to clearly confirm our belief. The whole process was instructive and we wanted to share it here. We’ll tell you why the researcher thought that there might be UV present, and what we did to confirm that there was not. The researcher was working with ethidium bromide (EtBr), a nucleic acid fluorescent stain widely used in molecular biology for techniques such as agarose gel electrophoresis. His understanding was that EtBr required excitation in the range of 300nm, well down into the ultraviolet, so when he placed a gel under the SFA and saw some EtBr fluorescence he concluded that there must be 300nm present. There is also literature, both scientific and from manufacturers, that describes the use of these short wavelengths for EtBr fluorescence – Biotechniques article, Analytical Chemistry article, ThermoFisher product page. Based on the information above, it is easy to understand why one would have a strong association between ultraviolet and EtBr fluorescence. With this mindset the researcher was absolutely correct to be concerned when he saw fluorescence under our blue light source. As soon as we were asked the question by the SO we knew that something else must be going on. There are some very good technical reasons why we knew there would be no UV present. So we have a mystery: if the Royal Blue light head does not emit shortwave ultraviolet, and if shortwave ultraviolet is needed to excite EtBr, then why is there fluorescence? Half of the statement above has to be incorrect, and it is the second half. We knew there was no shortwave UV, but just saying so was not enough – the researcher saw the light exciting EtBr fluorescence. We needed evidence and practical tests. 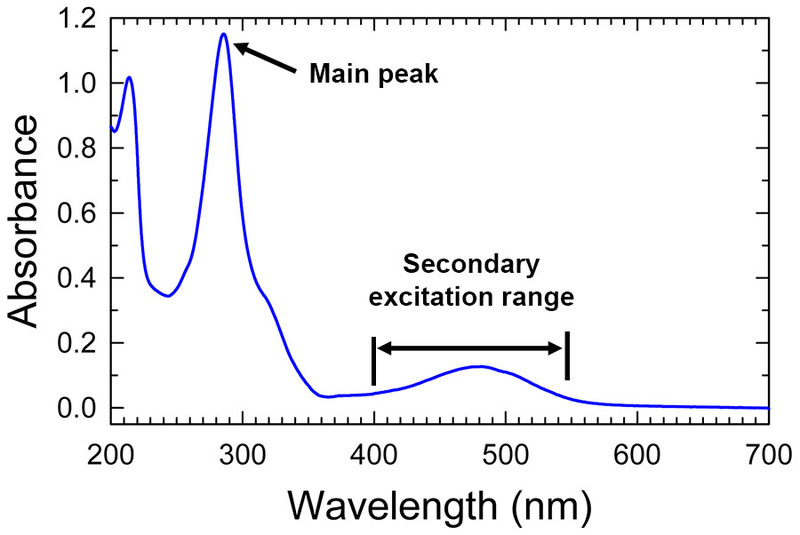 An excitation spectrum is essentially a graph of the relative ability of different wavelengths of light to produce fluorescence in a subject. The graph shows that shortwave UV, around 300nm, is by far the most efficient wavelength range for exciting EtBr fluorescence. But it also teaches that it is not the only wavelength range for this purpose. 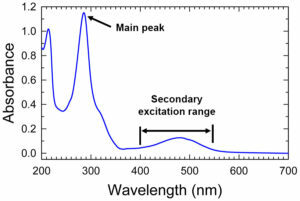 The broad, low secondary peak extending from about 400 to 570nm encompasses wavelengths that can also excite EtBr fluorescence, albeit much less efficiently than the short UV wavelengths. There is a lot of additional support for this. If you Google ‘ethidium bromide excitation emission’ you will find many links to tabulations of excitation and emission peaks for a variety of fluorophores. Wavelengths recommended for EtBr excitation in these tables include 493, 510, 518, 524, and 545nm! In addition, there are companies that sell blue-light transilluminators that can be used for EtBr. Check out this blog post from Vernier. Working collaboratively with the university SO we demonstrated to the researcher’s satisfaction that there was no dangerous UV radiation emitted by the Royal Blue light head. This was a valuable exercise in tying together underlying information about technology (LEDs), data on excitation spectra ranges, and simple, practical tests to understand why a phenomenon was happening.